The culture and history of British Columbia and the West. Literary prose, both fiction and non-fiction. We also publish POETRY, though we do not consider unsolicited poetry manuscripts. 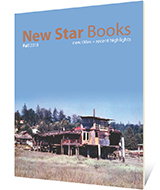 New Star also publishes Transmontanus, a series of short illustrated books about some of the more unusual aspects of life in a corner of the world currently known as British Columbia. We accept simultaneous submissions, but we'd appreciate knowing that other publishers are looking at your work. We cannot discuss book proposals on the phone. 107 – 3477 Commercial St.
FICTION: full manuscript with a query letter. NON-FICTION: full manuscript, or full outline & sample chapters, with a query letter. The information that other publishers are also considering the manuscript, if this is the case. For electronic submissions, a word processor document (.odt, .doc, .docx, .pdf) with double-spaced, 12 pt type. For hard copy submissions, unbound single-sided pages, a big enough self-addressed stamped envelope for return of manuscript if necessary; or indicate we can recycle it if not interested. Originals of photos or illustrations. Please allow anywhere in the traditional six to eight weeks from time of receipt for a response. If your book is accepted, it will be at least one year before it is published. If even after perusing our website you're uncertain whether we're the right place to approach, you can send us a query letter first. Due to the volume of manuscripts we receive, we are not able to respond with critiques of rejected manuscripts. Nor do we refer manuscripts or authors to other publishers.